Do you find yourself running low on storage space for photographs, vacation videos, and everything else that gets shoveled onto a hard drive? It always seems to happen sooner than we anticipate. If you don't want to delete your data, the solution is splurge on a large capacity HDD, and right now there is a sale on Seagate's capacious 8TB Barracuda Pro (ST8000DM005). Both Newegg and Amazon have it on sale for $320, which is about an $80 savings over its MSRP. That works out to 4 cents per gigabyte. 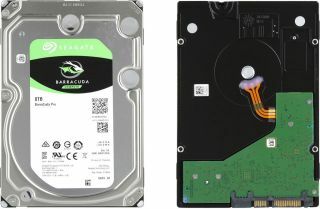 The Barracuda Pro is Seagate's performance oriented series with a SATA 6Gbps interface, 7,200 RPM spindle speed, and a generous 256MB of cache. Seagate's 8TB model has a rated sustained data transfer of 220MB/s (maximum). You can view the rest of the specs here (PDF), along with how the drive compares with other capacities in the Barracuda Pro family. Go here to grab the drive at Newegg or here to snag it at Amazon.